Cytometry is the measurement of various physical and chemical properties of cells. Flow cytometry is the process of making these measurements by suspending the cells in a fluidic stream passing by a light source (excitation) and detectors (emission). Analytical Cytometry utilizes flow cytometers to collect data on cells that may, or may not, be stained by any number of antibody-coupled fluorochromes. Learn more about the Hillman Cytometry Facility’s instrumentation for analysis of cells in suspension, or view our collection of facility-approved protocols and technical documents. Users must sign up for cytometer time in advance. Cancellations must be made by noon on the day before the scheduled time (this can be done by phone). Your account will be charged for the full time of a missed appointment. If you sign up for a time slot, please be on time. Please finish on time. Users must yield the cytometer to the next scheduled user. User training is offered for all of the facility’s analytic cytometers. Individuals are encouraged to learn how to best prepare and then acquire their own experiments. For individuals who wish to utilize the facility’s instrumentation after hours or on weekends, additional training is available to instruct users how to start-up, verify and shut down instruments. Card access is available to those who demonstrate sufficient knowledge and experience. Please keep the work area clean. All operators using the cytometer must properly fill out the time and effort log, grant account sheets, and data file list located at the facility. The facility reserves the right to revoke privileges from individuals who consistently disregard these policies. The recommended sample volume is no less than 0.3 ml. Samples should be resuspended in 12 X 75 mm Falcon 5 ml tubes (Falcon # 352002 and 352063). Slightly undersized tubes will damage the sample head. If you think your tube may not fit properly, please ask us for the tubes to transfer your sample. Samples should be fixed in 0.5–2% paraformaldehyde or methanol-free formaldehyde to kill infectious material. Do not use common laboratory grade formaldehyde. Infectious material should be fixed in paraformaldehyde for at least 30 minutes for best results. If cells cannot be fixed, please make prior arrangements with the facility. Please, no unfixed infectious material or radioactive material. Filter cells that are sticky or clumping with nylon mesh (Falcon 5 ml Polystyrene Round Bottom Tube with Cell-Strainer Cap 12x75mm; Part # 352235) or 1cc Tuberculin syringes. Anything less than 70 microns should flow through the cytometers. However, this assumes a single cell suspension. Cells that grow in monolayers, as well as large populations of dead cells or debris, will cause samples to clump. The Fortessa I is a four laser flow cytometer capable of detecting up to 15 distinct fluorochromes simultaneously. Along with traditional forward and side scatter, the Fortessa I is equipped with a PMT dedicated to detection of forward scatter, making the Fortessa I ideal for microparticle detection. The Fortessa I is compatible with the High Throughput Sampler (HTS) attachment, allowing for reading samples directly from 96-well plates. 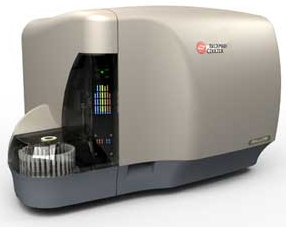 The Fortessa II is a five laser flow cytometer capable of detecting up to 17 distinct fluorochromes simultaneously. The UV laser allows for the detection of three exceptional flurochromes. The Fortessa II is compatible with the High Throughput Sampler (HTS) attachment allowing for reading samples directly from 96 well plates. The C6 is a dual laser flow cytometer capable of detecting four distinct fluorochromes simultaneously. 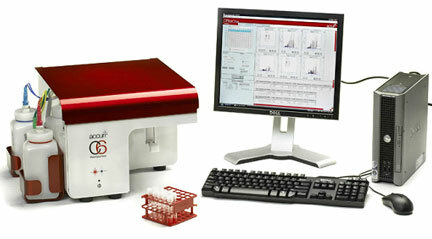 Along with traditional forward and side scatter, the C6 is an ideal instrument for basic analytical cytometry. 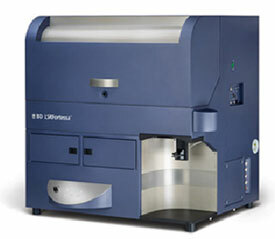 The C6 is optimized to run samples using any of the following flurochromes: FITC, PE, PEcy5.5 (or PE cy7) and APC. Users can run single stained samples of combinations of these fluorchromes with minimal spectral overlap. Fluorescent proteins excited by the 488nm laser can also be analyzed on the C6. If you have any questions about getting started on the C6, the facility staff would be happy to assist. The Gallios has three lasers and can measure up to 10 colors. A forward-scatter detector provides up to three measurements of cell size and visualization of particles down to 0.404 µm in diameter. A side-scatter detector incorporates an independently focused, high-performance photodiode with electronic attenuation. Simultaneous measurements of integral, peak and width are available for all parameters, including scatter and fluorescence signals. A selection from up to 62 parameters can be processed per analysis, at acquisition rates of 25,000 events-per-second, with high yield.